Ghost hunters explore dark places, investigate clues and uncover secrets of the dead. Evidence of an afterlife may prove elusive and few hunters recognize some things are best left buried and forgotten. + A curious ghost hunter tracks down a mysterious device's origin and finds more than he bargained for. + One local tour guide meets a group of cocky professionals in a small town and discovers something more frightening than ghosts. + After his famous ghost hunting wife is declared missing, a devastated husband follows a trail of clues to find her. + A team of researchers at a local university are in over their heads when they try to prove a house is haunted. + When a desperate mother offers his services, a boy who can talk to ghosts is dragged into a dangerous mystery. + Lost without their go-to guy, a group of ghost hunters fight each other to get him back on curious terms. + Tragedy looms when a group of friends enter a suspicious house and realize they're unequipped to hurt what's already dead. + A skeptic and a believer team up to expose the truth about a local legend in a haunted forest. + An iconic figure confronts a man to find out if he's building haunted houses or if it's a bizarre hoax. + Strange circumstances compel the ghosts from a troubled veteran's past to reappear in the present. + A friendly warning turns into a bizarre rescue when a ghost hunter tries to help an amateur armed with an odd locket. The digital edition includes the PDF, ePub and Mobi (Kindle) versions of the book. Haunted received two Honorable Mentions in Ellen Datlow's Best Horror of the Year Volume 4. 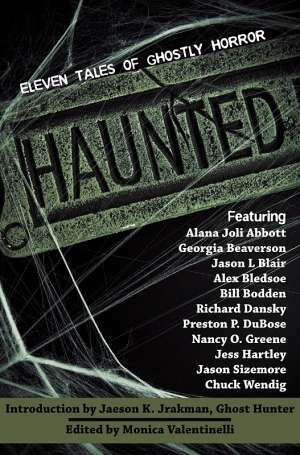 Haunted also took the top spot in the anthologies category of the Preditors & Editors Reader's Poll 2011.